Hello everyone ! It's Mindi here again with you here today. I am going to be sharing some pages that I created for my second project this month using Girly and Strong. Recently I have been working on creating a separate Disney album. We recently had annual passes and went frequently over the span of a year. So I have soooo many fun photos to scrapbook. I have always love Merry Go Rounds ever since I was a kid. They have one in Fantasy Land at Disneyland and there are Merry Go Round horses throughout this collection. I decided to scrap some of my Disney photos using this collection. Let's get started shall we. Here is a look at my first set of pages. The colors in and around Fantasy Land are a great match with the Girly and Strong collection. I printed out 2 4x4 photos for this left side of my spread. One is of the kids eating some treats and another one is of Katelyn on Dumbo. This page protector is from Simple Stories and it has this fun 2x8 pocket. I cut down some of the patterened paper and used it as a journaling space along with some fun embellishments. I really love the patterns on the planner pages. They are great additions to your album and can add a different size to your albums as well. I am using one of the smaller size here. On the top I added a photo and then some journaling and embellishments on the bottom. Here is what the other side looks like. 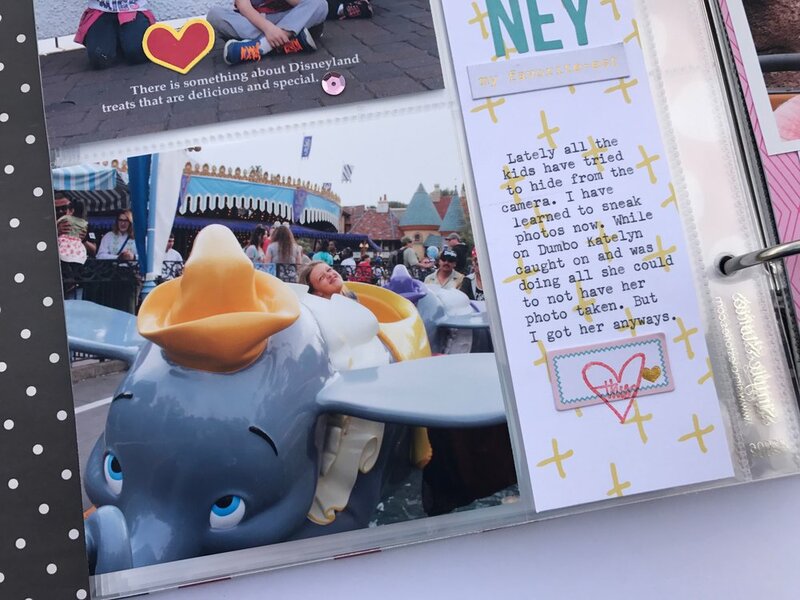 Again I love this planner page and it was perfect for these set of photos of my son on the Merry Go Round. I left the planner page pretty plain to make sure the adorable unicorn was the center of attention. Although I did a few fun embellishments and stamps to the bottom. Here is a close up. On the right side is where I have some photos of my son Noah and also his grandma and grandpa who were there with us at the time. So that makes it extra special. I chose to go with this Stay Weird card for this page. It was the perfect fit for these set of photos. Noah always loves to be silly when I am trying to be serious and take his photo. I am really happy with how this all came together. This kit is so versatile and the colors are my favorites. Thanks for joining me today. See you all next time.